How much do you know about your company’s cap table? Or do you already manage your company shares, but are still looking for company funding from investors? Well if you’re like many entrepreneurs who aren’t aware of the numerous financial terms and legal agreements to run your business, it all may seem a bit overwhelming at times. Today we will be sharing an example to help you understand some of the mechanics that work around the initial funding of a company. You would also learn about the financial instruments that might come into play along with the various legal structures. It would help you understand how to go about it when a situation arises. Note: Everything mentioned in this case study is purely fictitious and has been created for the sake of the example. If there is any resemblance of any kind of real situations or firms, kindly note that it is purely coincidental. For any other queries, you can connect with us directly. For explaining the scenario, I have a great example in mind: There were three founders named David, Elijah, and Thomas. They had a wonderful idea that brought them together: Recyclable Items. These three studied from the same university and had many brainstorming sessions to create change in the way the world used dishes. That is when they used their science skills to create a formula that would help in producing recyclable items like dishes, cups, and lots more. Before they could go to a lawyer to have their corporation set up, they decided to sit down to clear how their shares would be divided and on the name of the company. The name that came up after a little brainstorming was – Inovia Inc. They felt that the name shared their innovativeness and the idea to make the world more greener. Once this was done, they then set out to contact one of their friends who is a lawyer so that they can have their company set up and begin with their journey towards making the world a better place. The lawyer prepared all the needed documents. The ownership stakes were split in the ratio of 31.25 : 31.25 : 37.5, where the highest went to Thomas as he was the one who worked out most of the formula and got the idea to start the company. Thomas had the most technical knowledge to take the company to a different level and help the company succeed. He was also designated the CEO of the company. From the total stakes that the company owns, these three decided to keep 20% of the shares aside in an equity pool so that it can be used for investment later on and to offer to employees with it. Inovia Inc. is incorporated in Nevada as a C corporation, which is the basic business entity for venture-backed companies. This just meant that the company started off with 10,000,000 shares of Common Stock outstanding. And since the company was just created, the value of each share is at $0.001 per share. Thomas, David, and Elijah created their cap table using the Eqvista application, that is FREE to use. This app would help them keep track and manage all the shares in the company. They sat together and added all the data of the company to organize their ownership in the Eqvista app. Below, I have shared a screenshot of how many shares they have and the percentage of their ownership up till now. Thanks to the Eqvista app, all the details are kept up to date in real time. Based on the plan that Thomas, David and Elijah worked on, 2,000,000 shares were kept on the side as ESOs (Employee stock options). 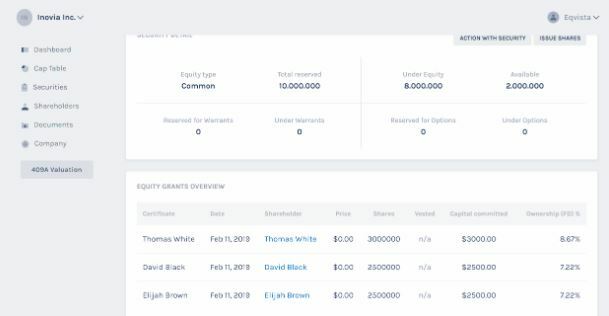 And so that the shares could be kept on the side, Thomas create the ESO pool that can be seen in the table along with the other shareholder’s ownerships. By now, we can see how the cap table looks. And as we go ahead and the company grows, the cap table would become more complicated. Thomas decided to use Eqvista to make the whole process easier. With all these things sorted out, the three founders began to look for funding to purchase the raw materials and equipment. While Thomas began to check the formula, David began to look for companies that had the equipment that they would need to produce the various products. On the other hand, Elijah took up the responsibility of looking for an investor for their pre-seed round. They just needed some money to test their products in the market first. For being able to create the initial products to be tried out in the market, Elijah decided to contact his friends to spread the word that they are in need of investors. One of his friend introduced Elijah to an angel investor who was ready to offer investment in exchange for convertible notes. To explain pre-seed investment more, the very first stage of financing a company is called pre-seed funding. This process comes very early in the company, which is why it is not included in any of the other funding rounds. This stage is for a period when the founders of the company are working towards getting their operations off the ground. Usually, the pre-seed investors are the founders themselves or people like the founder’s family, friends and supporters. Based on the kind of company, the initial costs needed to set up the company is normally low. And the time taken for the company to be set up also depends on the nature of the company. But in case the amount needed is a bit more than what the founders can afford, they then look for outside investment, as Elijah did in this case. Since the investment is from the outside, the investor has asked for convertible notes in exchange for the funding. Elijah and the team needed a $50,000 initial investment for setting up everything. The investor agreed to it and the deal was finalized. Before we can move ahead, let us understand what convertible notes are. A convertible note is like a short-term debt. It converts into equity of the company when the second funding round of the company takes place. The investor would invest in the company and get the convertible notes, that would later turn to equity. The total amount of equity would be based on the FMV of the shares during the next funding round along with a principal plus interest. Note: You can find out more about convertible notes in detail here! In this case, the investor agreed to invest in Inovia Inc., and take the convertible notes in exchange, knowing that there can be a risk if the company fails and his investment is lost. This is why it was a tough thing for Elijah to convince the investor (angel investor here) that they had a great idea that would be highly successful. After finalizing the deal, the production began and the founders got to work. They produced about 1,000 plates, that are both degradable and safe to use, instead of plastic or paper plates. They then sent them out to the market. The response they got was amazing, and all the products sold in a matter of days. They even met a buyer who wanted to order 10,000 pieces from them. But before the founders could get back to working on the production, they had to hire employees. And with just a little capital left in hand, it was not possible to pay salaries to professionals needed for the business. Without employees, they would not be able to work on the order they received. So, they decided to hire top talent by providing them with employee equity compensation through Employee Stock Options (ESOs). This compensation plan was offered only to the senior staff, and those who stayed with the company for 5 to 7 years. If anyone left before that, they would not be able to enjoy the share bonus. The hiring process started and they hired 10 employees from which 2 were designated as the managers of two different teams. These two employees were offered with the stock options as promised. Not entirely sure what the ESOs are about? Let me explain about then in brief before continuing with the case study. Known as employee stock options, ESOs are equity compensation provided to executives and the employees in the company. In this plan, employees can choose if they want to buy the shares of the company at a predetermined (mostly a discounted price) after spending a specific time in the company. An agreement was created, and both the parties agreed after certain conditions were discussed. Note: You can learn more about ESOs here in details. After a while, the founders felt that they were short on cash even after working on many orders. That is when they decided to take up another round of funding to keep the business running as the costs were growing and orders were not what they used to be. David thought it was best to get investments from their family rather than outside investment, to reduce the burden on their share ownership. And David was right in this case. If they planned to go further and grow the company, they would need to save their ownership from diluting. So, Thomas decided to ask his rich aunt for help. After some persuasion, his aunt accepted the offer to loan them enough to help them operate for a bit longer. This next investment came under the seed investment stage. Seed funding is the investment that the company gets after the company has got off the ground and started. It is the very first round of funding that helps to run the company and help it take its first step towards growth. Mostly, seed funding is offered by angel investors, but in this case, the founders decided to take the help from their aunt instead. Anita, Thomas’ aunt, gave the company $100,000 that helped them take care of the larger orders and produce up to 5,000 to 10,000 pieces in a week. For a while, the company went smoothly and they began earning profits. Also, the production numbers increased to 25,000 piece produced in a week. But with this step, even though it was from a family, the company had to get its valuation done to have the convertible notes converted for the pre-seed investment the company received. A professional was contacted and the company was valued at $10 million where each share of the company reached to be valued at $1 per share. This meant that the convertible notes offered to the angel investor in the pre-seed round would be converted to equity after adding interest. Fast Forward one year; Thomas met a supplier who asked them to produce about 100,000 pieces in a week. As per this supplier, customers were requesting for the products in various supermarkets and he wanted to ensure that they got to everyone. This was where the catch came in. Thomas and team couldn’t afford producing this many products with the equipments, employees and raw materials they had. This meant that they needed to get more investment into the company. Since the company has already passed through the pre-seed round and the seed round, the next company funding round was the Series A round. As soon as a company had a good track record and begins to earn for itself, the company chose to opt for the Series A round of funding. The reason for obtaining the funding is normally to grow the company and expand the empire. In the case for Inovia Inc., it was the same. Thomas got the order to offer more than what they produce, which means that the company would earn more than what they did before. This helped expand the company. Usually, the Series A round offers about $2 million to $15 million investment to a company based on the amount needed. And in this case, the investors were not angel investors, but venture capitalists who offer the investments. Angel investors are often small and semi-wealthy businessmen who are looking for investing in something that can help them earn a bit. Venture capitalists on the other hand are normally very wealthy businessmen or large firms that can offer a larger amount of investment to the company in exchange for equity. To be clear, in this round of funding, the investors do not just want a great idea. They want an successful company that has a solid strategy that would grow their profits. The Series A round are of two kinds: unpriced and priced. The priced round is like all the other funding rounds where the company’s valuation is done and the stock of the company is purchased for cash by investors. But as of today, the unpriced round is very common among companies. In this round, there is no valuation of the company. Moreover, the investors would not be purchasing a specific amount of equity at the time of investment. The deal would just be an agreement between the company and the investor for issuing shares in the future for a priced round to the investor. This is normally in exchange for an infusion of capital when a deal is struck for the unpriced round. Two common instruments that are used in the funding rounds are the convertible notes and the so called KISS (Keep It Simple Security)/ SAFE (Simple Agreements for Future Equity). As per this case study, Thomas has already used the convertible notes for the pre-seed round. But in the Series A round, David, Elijah and Thomas decided to use the SAFE as a dealing chip for investment. A SAFE is a lot like the convertible note, just that it does not have any obligation to pay interest like convertible notes. The SAFE is friendlier for founders, as it is not treated as debt. Furthermore, they do not have any interest payments or maturity dates like convertible notes. The terms to negotiate are less and the agreements tend to be short. Since the supplier wanted a large order from Inovia Inc., it was crucial for them to enter the next round of funding. This is because even though the company was undergoing rapid growth, the profits were not enough to cover such large orders. This time, David decided to use his father’s contacts, as a lawyer, and would have connections that could help them find interested VCs. At this point, they were looking for about $5 million investment to increase the production and expand their horizons. After some searching, Elijah and David met with a known VC firm who felt that their idea would help make the environment better. And due to this, they wanted to be a huge part of it. The firm named Titix wanted the idea to expand, and Thomas would also have to work on the formula for the products to last for 6 months to a year so that people do not have to dispose them quickly. And in turn, the firm was ready to offer them with a funding of $7 million, including the costs for the research that Thomas would get into as well. Overwhelmed with the offer, Thomas requested the firm to make the deal to invest the money in a SAFE instead of gaining equity of the company immediately. And after some discussions, the firm accepted the offer as they found the business idea had potential to fill the market’s needs. All Inovia Inc needed to do was use strategies to reach out to people and prepare the best products while working towards this new goal. The final signing of legal paperwork and checks sets off significant capitalization table adjustments as the company was offering shares to investors in the company. In the case for Inovia Inc, we can see that the company has come across many steps for investments that would have affected the cap table. Moreover, the ownership of all the three founders – Thomas, Elijah and David would have diluted greatly as well. Dilution matters when it comes to controlling the company and the voting structure. Most agreements are bound by many types and number of shares belonging to shareholders, investors and the founders of the company. But in this case, like in many others, the founders and the investors ensured there were anti-dilution provisions in place to keep hold of their control in the business. 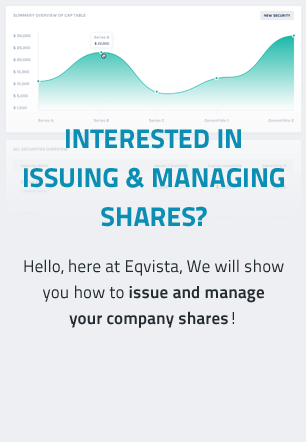 Issue & Manage shares with EqvistaGET STARTED, IT'S FREE! From the above example, you can see how much investment and giving out of shares are needed in a company. For a company to grow and become what the founders have in mind, it would have to evolve. The founders would have to include many important people to a part of their board of members. But that is not all that makes a company evolve. Giving out equity compensation can also do wonders. You would be able to hire the best talent in the industry. To get the best talent on your side in your company, you would need to offer shares as equity. In short, you would have to give a part of your ownership up for the future growth of the company. All-in-all, it is always better to update your cap table, starting from when you incorporate your company and become a founder. As you move ahead, the details of your company would become complicated. So, it is always better to be sure before you make a decision. The best way to do this is to use Eqvista (which is for FREE) just like David, Thomas and Elijah used for their company in this case study. Learn more about the application here!